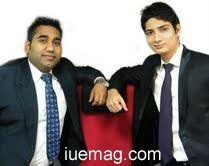 Entrepreneur 1: Gaurav Gupta & Rahul Pawale: We have started with a strong vision to revolutionize the e-commerce industry. In a very short span of time we have marked our presence in various sectors in the online arena. To name some of them are tourism, education, insurance, online bidding, online shopping and many more in the pipeline. Entrepreneur 2: Justin Jose: I run mainly 3 business firms in Cochin, Kerala. I own a music production company named A&J Music Creations through which I produce Music Albums, Audio Albums of many category. I also own a Marketing company named OZONE Sales Corporation through which I market Electronic Cards & Printers. Last but not the least I am running a manpower recruiting agency named www.jj4job.com, Cochin, through which I provide manpower to abroad clients based on their requirement. Who is your inspiration to start business at such a young age? E1: Gaurav: My father has inspired me not only by his passion towards work but also by his efficiency of execution. Also, I would love to mention about the person whom I have always considered as my mentor in many ways. He is the one who taught me how to turn dreams into reality. Rahul: My parents have been my greatest inspiration. Everyone has difficult times with their parents when growing up and so did I, my parents never used to get satisfied with my achievements as a kid. But I never could understand then. But today I want to say, if not for their expectations, I wouldn't have had the drive to achieve greater heights. E2: Justin: Situation was my inspiration. I started my career in a company in Chennai. I worked very hard there. I very much knew that the salary received by me, was almost a percent of the turnover that company used to make of my efforts. When I found that the situation was going out of control, I decided to start a venture of my own. E1: Business is all about dream and passion. A dream is a snapshot moment of idyllic perfection. A passion is an ongoing burning that compels you. We believe we are having both. You must have heard "Do what you love." If you truly love what you're doing, you will work passionately, willingly and fearlessly, and we ADORE our work. E2: I believe that there is nothing in this world which is not my cup of tea. You can think of any idea I'll say it is possible to get, provided you have the erg to achieve it. I believe I have it so I do it. What do you do in the down time, if you have ever faced one? E1: Aspiration level will not decrease during down time and we will not lay back but will get back with double energy and passion to make eLife a globally renowned Brand. E2: The first step is to come back home and give yourself some time than reacting to the situation immediately. This gives you strength and time to analyse the problem properly. I believe there are no big issues, we only fear & feel it is big. What style of working have you adopted; do you work constantly or do you work with leisure? E1: As entrepreneurs we are up all the time. It doesn't matter if it is day or night, each of us focus on our vision. We ensure that we stay focused. Above all, we have built a business with strong values and rock solid integrity. However, the most important aspect is that we got along really well and that energy got transferred to employees and associates. E2: I feel my work is my leisure and the only time I make myself free is the time to spend with my family. What area of business you are concentrating more on? E1: Business is all about changing and evolving. And to last longer we concentrate upon bringing new ideas, products and services. We implement a process of continual improvement so we can be sure we're a better entrepreneur today than we were yesterday. We are aware about the fact to become successful entrepreneurs we must work hard but we keep our focus on finding ways to work smarter, becoming more efficient. Every day we look for opportunities to streamline our activities and improve the return on our time investment. We want to make this world a better place and make eLife a global brand. E2: I put my full focus on service sector in India. Because, India has a huge population; so, service sector has high potential of growth than any other area of business. What type of executive do you prefer, cautious or maverick? E1: I would say that I would prefer maverick. The mavericks don't let their challenges stop them from pursuing their goals as the deeds they do are their decision and they take the accountability of the outcome. They understand that they are often going to have to do things differently from other people and they are okay with that .That is what success demands, work beyond boundaries. E2: I would prefer cautious individual than a maverick one. Because, in business right decisions and actions matter a lot. Having mavericks always lead to confusion. E1: Learning. The day you think you know it all is the day you begin to slide backwards. We get excited by opportunities to develop our knowledge base and that's why the internet arena is important to us, as the pace of evolution is extraordinary. In our rapidly changing world, it is essential for us to continue improving our skill-set. We take some time each day to learn or improve on a skill. E2: People are my motivation. I see India as a collection of number of opportunities which are kept opened for young energetic entrepreneurs. Do you believe in Luck or Hardwork or both? Why? E1: I believe that if the luck knocks an unprepared mind, there is a high probability that he missed the opportunity and hence misses his luck. Hard work puts cause and effect into motion. Once you have experienced the effects and rewards of hard work, luck willingly climbs aboard. We have to take advantage when luck is on our side, and do as much to help it as it is doing to help us. This is called the principle of favor ability or beginner's luck and we keep our faith in it. E2: I believe in both. First priority always goes to hard work and there is no alternative for it. But when we clearly know there are certain factors in life which a human cannot do himself, then we are forced to believe in luck. What are your "career aspirations"? E1: As far as career aspirations are concerned we would not settle for a life less than exciting. As entrepreneurs, our utmost priority is to grow our business. Create more and more young entrepreneurs.. We aspire to make eLife universal. E2: I want my company to be "The Brand" in its respective area of business and would want to grow unstoppable. What are the problems that you have faced while establishing your venture? E1: There were various issues during the initial phase. Some of them are; timing and relevance of the business idea, appeal of the solution to the customer, market awareness, availability of cash, management team, ability to make sufficient sales, etc. There are challenges in almost all the areas and need to be planned and managed carefully. The launch period proved to be a steep learning curve! There were many surprises, many problems with the initial development of the sites but we are pleased to say we got through it with grit and determination and we are very proud of the brand we are creating. As a matter of fact, we're still a growing business. The most crucial thing, however, is to move out of the office, go on the front line and meet customers and close sales. As an entrepreneur you need to present yourself as a salesman. E2: Making my family understand about the decision was the only tough thing I ever faced. When problems are considered, no business can be done without making the government officials feel happy about it. Have you ever felt overloaded? E1: Yes. It happens even to the most organised individuals. During the launching phase we were working 24X7 and the results were evident. However we realized that the reality is that no matter how driven you may be, your body isn't built to take on a 24/7 world. Endless work hours don't lead to increased productivity or innovation. That comes from a rested, refreshed and energized brain. You can get more done in less time when you know what to say when. We have learnt to prioritize tasks. Our main challenge is still to work collaboratively with sales team to enhance sales and traction with very limited resources. In addition to primarily growing the business, we also need to support the existing customers, keep them happy and analyze how their input influences our business. We are getting a lot of great feedback from our customers and visitors; very soon we will reach the top of the ladder of success. E2: No never. I believe that the responsibilities have approached me today, because they know that I can handle them well. E1: Once Donald trump, a multi billionaire said "If you cannot handle the pressure, don't be an entrepreneur.. go get a job." Stress is something every entrepreneur must face while undergoing the entrepreneurial process. In fact, we can't avoid it. From the day we launched our business till date; stress poses as a major problem. So we have no option but to learn how to deal with stress. E2: Being a strong spiritual person is the one best way to handle pressure. Other ways are to discuss the issue with the one whom you think can help.